It’s been a very busy start to the year for all of us on the DVLA enforcement team. We’ve been all across the country in various locations looking for vehicles that have not been taxed - and we're not done yet. It’s all part of a wider campaign targeting the 11 locations of the UK where vehicle tax evasion is highest. In 2018, we took enforcement action – ranging from fines to clamping – on more than 464,000 vehicles in these areas. As well as the hard work we’re doing out on the roads every day, we’re running local advertising in each of the regions including radio, printed publications, poster sites, websites and on social media. All of these activities together are designed to make the driving public think again if they’re considering not taxing their vehicle. There really is no excuse not to tax. It’s never been easier for motorists – on GOV.UK you can tax your vehicle 24 hours a day and if you are not sure when your tax is due, you can check your vehicle tax is up to date. You can even check on Amazon’s Alexa or check on Google Home if you want. All you need is your vehicle registration. One of our highlights of the campaign has been taking our giant clamp to some of the locations and putting it in city or town centres to see what reaction it gets from the general public. We’ve clamped nearly 9,000 vehicles so far during this campaign, but we’re not stopping there. Our enforcement teams work across the country on the look-out for untaxed vehicles, and our message is the same wherever we go: tax it, or lose it. Follow DVLA on Twitter, follow us on Facebook and connect with us on LinkedIn. You can also subscribe to the DVLA digital services blog. Should never have done away with the tax disc.There should also be one to show the vehicle is insured. Hi Steve - see my reply to Roger L.
In Ireland cars must show a tax disc, insurance disk and an MOT disc. Far better system. Hi Brannon - see my reply to Roger L.
Its about time, maybe us taxpayers may get a drop in tax if more are caught. Too many people have got away with it for FAR too long. It's good to see positive action being taken. I know the road tax doesn't all go to repairing roads but the extra funds I hope help improve road safety and vehicle damage. Whilst I agree with your sentiment you are way behind the times. There has been no road tax since 1937, it is Vehicle Excise Duty. It is not spent on the roads. Roads are the responsibility of councils. VED goes to the Treasury coffers and is not ring fenced for anything. It is spent as other general taxation is spent. It is a tax on vehicle ownership where the vehicle is on public ground. About time that action was taken against those who choose not to tax their vehicle. Bring back the tax disc, that does away with the guess work! Hi Roger L - it’s never been easier to tax your car, it’s just a few clicks to do it online and you can do it 24 hours a day. Customers can also pay by Direct Debit or at the Post Office. Well done.......check their MOT and insurance too .........!! Confiscate the cars AND permanently ban the owners/drivers from driving. NO MORE SOFTLY SOFTLY TREATMENT FOR OFFENDERS AT THE TAX PAYERS EXPENSE ! I agree with Glen 100%, I also think the road tax should be done away with, but instead put it on the price of fuel, so if you are using a vehicle, you are paying road tax. I agree, taxing your car online is so easy. Five minutes and it is done. The campaign is to be applauded. But, when did the tax cease to become the Road Fund Licence? Surely the revenue that the tax generates should be ring fenced for the maintenance of our roads - some of which are in an appalling state! This is a common misconception – there’s been no direct relationship between vehicle excise duty (VED) and road expenditure since 1937. The revenue raised from VED goes to HM Treasury. I wish they would target the coil estates and no go areas of the cities and towns rather on the mostly law abiding. It’s always the same, easy wins with no hassle. Hi Chris - we’re all across the UK with our national wheel clamping partner and clamp or impound any untaxed vehicles, as well as issuing fines and penalties if a vehicle is untaxed. We have a range of enforcement measures and they remain a very effective tool for ensuring an untaxed vehicle isn't driven on the road. Not all of these measures are visible. I've reported my neighbours 7 times in 15 days. Why do they still get to drive their vehicle? Hi Dan H - see my reply to Chris. A good campaign. Paying monthly by monthly direct debit helps spread the cost and ensures that tax is renewed automatically each year. It is unfair that DVLA taxes cars twice in the month they change keeper. The previous system was better. It wouldn’t surprise me if some of the evasion is because you’re collecting double the amount you’re entitled to. It's been a long-standing feature that vehicle tax is issued from the first of each month and refunds are issued for only complete calendar months remaining. This didn't change when we got rid of the tax disc. When a keeper sells the vehicle they must tell DVLA and we'll automatically issue a refund of the remaining months. All new keepers must tax the vehicle when they buy it, rather than having to find out if it's taxed or asking the previous keeper if they're going to apply for a refund. VERY glad to read about this action! Agree entirely with this campaign and comments-to-date. And for persistent/repeated avoidance, tax it or lose it, no excuse. I live in rural Essex and there are more vehicles driving round the lanes without tax than those paying the tax. Why should I as a disabled pensioner feel that I should pay up when many of my local neighbours completely ignore the duty to pay up? Nobody ever checks up in the villages and B roads. Taxing the car is so easy these days but evasion is widespread and without a tax disc nobody will ever know. You’re right to say that it’s never been more straightforward to tax a vehicle – it takes just a few clicks using our online service on GOV.UK. Customers can also pay by Direct Debit or at the Post Office. More than 98% of vehicles on the road are correctly taxed, which clearly shows that the overwhelming majority of motorists do the right thing, but it’s right that we take action against those who don’t tax. About the tax disc, it’s been nearly 5 years since we got rid of it; this clearly isn’t about people not knowing their legal responsibilities and this campaign highlights the consequences for those who choose not to tax. 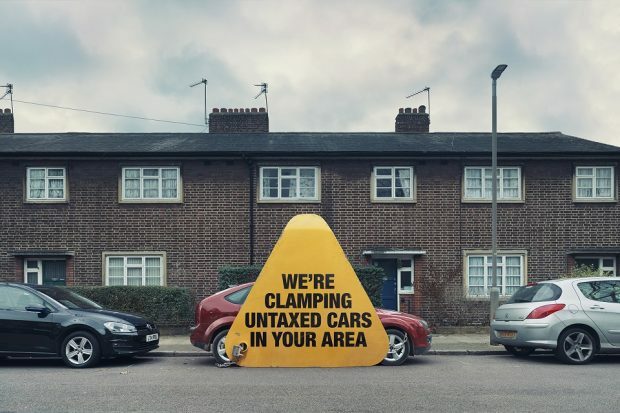 And regarding those who ignore their duty to pay up - we’re all across the UK with our national wheel clamping partner and clamp or impound any untaxed vehicles, as well as issuing fines and penalties if a vehicle's untaxed. Great keep it up. Shame that you cannot get uninsured vehicles of the road as well. John think you will find that particular legislation is in existence and is being LADLED out accordingly! Hi John - see my reply to Chris. Why not go back to the Car Disc. Others can see if it has been paid. So can the Police & Traffic Wardens. Then you would have no need to spend time & money using your present methods. Hi Mr Williams - see my reply to Eric. I agree with the comments above but you need to bring back the tax disc. Then everyone can see if an untaxed car is on the road - and report it. As things are now most people won’t know if an untaxed car is on the road and it may be a long time before DVLA finds it. Hi John - we’re all across the UK with our national wheel clamping partner and clamp or impound any untaxed vehicles, as well as issuing fines and penalties if a vehicle is untaxed. It's only difficult to tax it if you don't believe in MOT or insurance! It's important to remember that not all of the enforcement measures we take are visible. I agree it is good that you are taking action, but it seems that tax evasion has increased since you abolished the tax disc! Hi Eric - more than 98% of vehicles on the road are correctly taxed, which clearly shows that the overwhelming majority of motorists stay legal and tax their vehicles on time. It’s been nearly 5 years since we got rid of the tax disc; this clearly isn’t about people not knowing their legal responsibilities and this campaign highlights the consequences for those who choose not to tax. We know that more people are chancing and skipping one or more months of vehicle tax – which is exactly why we're running this campaign. Well done get the dodgers off the road. Hi Jeff - see my reply to Chris. and demand payment in full within 72 hours otherwise vehicle will be crushed without mitigation of above total cost. HIT these dodgers HARD - they deserve it. I'd rather the vehicles were removed from the roads than clamped and left as an obstruction. Hi Brian - see my reply to Chris. Whoever was it who thought it was a good idea to do away with the very visible tax disc in the first place ? Hi - see my reply to John Lock. Comments are all about doing it online but don’t forget the post office so it is not difficult. Keep doing it. What else are these offenders hiding..dodgy fuel..mot.. insurance.. stolen.. Waste of time and effort.You would be better employed following up on reported untaxed cars on your website.I've reported over a dozen in my street and you've totally ignored them.Tell the public why.!!!! Hi G. Baker - see my reply to Chris. It’s not because it’s difficult they simply don’t pay the tax because the chances of getting caught are minimal. No excuse .....and you don't have to pay it in a lump sum any more monthly direct debit spread over 12 months .....if you can't afford car tax it's most probably not insured or moted as well. Hi D Harri - see my reply to Chris. Maybe people would tax their cars if the roads were better looked after. About time, fed up with those not paying but still driving on our roads. I reported an untaxed car two months ago on the dvla website. Still there and no action taken. Hi Ralph, see my reply to Chris. Hi Paul, see my reply to Chris. I’m 72 years old and could easily sort out my vehicle tax in line. I pay monthly and don’t feel the pinch of a lump sum. Easy peasy. Stop dodging and start paying your way like the rest of us!! Do away with this out dated system. Just add duty to fuel. Use it you pay for it. Simples! Stop messing about. Check for tax, insurance and MOT and if they haven't got any of them, take the car and crush it. I totally agree with everything that has been said,why should they get away with it.Keep it up catch them all.Who knows we may get a reduction. I moved onto an estate 3 years ago and used the app on my phone " Is this car taxed" out of 6 cars I checked 2 had No tax, 2 were on SORN and 2 were legal and were being driven daily. Chances are no insurance either. Carry on DVLA it's a great campaign!!! Hi Mike - see my reply to Chris. Hi Alan - see my reply to Roger L.
Brilliant! Let's get those who cheat to have a pang of guilt and pay up. Keep it up I have to tax my car so shoud every one else well done. Strange report. I had an untaxed vehicle parked outside my house earlier this year. Police weren't interested & said report it to DVLA. I did.....TWICE....but nothing happened and the "owner" eventually came along and drove off in it four days later. Hi Paul - see my reply to Chris. Hi Dave - see my reply to Chris. We've had a van and car in our road that haven't been taxed since April last year. Reported it over and over again even infomed the police who were not interested. DVLA stop talking the talk and do something about it. Look at your emails. Hi Sarah - see my reply to Chris. Yes GREAT NEWS!! But what about the TRUTH? I and my Brother reported a vehicle left outside his house after I was defrauded by a seller. The bahiclr was 'Not as Described' and that is the NICE version. Anyway after advice from DVLA reported vehicle to Council. Then Police. Was told Vehicle will be clamped by DVLA and notice appended. Vehicle will be removed and disposed of within 28 days. Vehicle was not Roadworthy. No Tax. No Insurance. It Was removed a little over 6 months later!? NOW read the article again. I agree with all the comments been given.This should have been done years ago.If people are on a low income and struggle to pay.Just put a little away each week then when its due you will have enough to pay it and won't miss it so much. Cartax should be added to fuel then it would be much more fair. As some people simply can't afford to run a car 7 days per week. I've got three vehicles all taxed, mot'd and insured. Just taxed one of them using the monthly direct debit just to make sure I don't forget. Simple. Happy to report suspect vehicles. So a car in our street, that has been reported twice is still facing the wrong way on a one way street, no tax, no insurance. Hi Matilda - see my reply to Chris. I have reported an untaxed car with expired MOT several times on your website. But there it is everyday. Parks in the same spot so what is the point? Hi Toni - see my reply to Chris. We all need to pay our car tax. If you want a car you pay""simple""
One of my neighbours has two cars - currently one has no tax (from 1st Feb) and I am reliably informed that the other had no insurance. Hi Deadilus - see my reply to Chris. Why do we not have a Tax disc an MOT disc and an Insurance disc. EVERYone can see and ANYone can report the culprits. I have seen on a documentary in other countries they confiscate the vehicle for 14 days too, just to emphasise the point ! The vehicle gets crushed if the keeper fails to respond. OK good try, but it would be so much easier to spot an untaxed vehicle if you issued a TAX DISC. Then even we the people could help.Mind you I was a bit miffed to have to pay £130 tax on my electric car with a small engine driving a generator. I have used less than 5l of petrol in 2years and 7000 miles.Just doesnt seem fair when my daughter drives a diesel Audi and pays £0 tax!!!!! It is obvious to most people, that the tax disc system should not have been abolished. However, I don't think you want to hear that. Hi William - see my reply to Roger L.
No clamp fitted and photos to prove its never moved in 18 months so how many others have been wrongly fined all photos available to any one to see. Hi Brandon - see my reply to Chris. I guess they just haven’t gotten round to my area yet. I have reported numerous vehicles for no tax/MOT, and nothing seems to be being done about it. One vehicle was a taxi that had been without tax for over 6 months, another vehicle has had neither since 2016! !